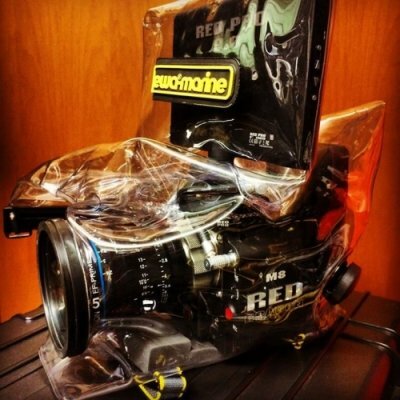 The underwater housing A-RED is a 10 meter depth housing for the RED Epic but of course also RED's Dragon, Scarlet and Mysterium-X will fit. Specifically constructed for these cameras the A-RED housing is manufactured from double laminated PVC and has an integrated, optically neutral flat glass port. A large tube is integrated on top of the housing to fit the 9" RED touch LCD which allows for great viewing. You will be able to fit a "RED BRICK 153Wh" inside of the housing. An air valve is installed in the underwater housing, can be drained with air if required. The A-RED housing is especially suitable for the beach, in the rain, in the desert, but also for snorkeling or diving (up to 10m depth). Designed specifically for the RED Epic camera, the ewa-marine A-RED underwater housing is manufactured from our special, double laminated PVC and has an integrated, optically neutral flat glass as a front port. With this housing you will receive a set of adapters that fit the filter threads of the most popular lenses on the market today. By means of this adapter the camera is then docked into the housings front port, ensuring that the lens remains parallel and centered behind the front of the lens. Just as if it were a clear, neutral optical filter. It has a pair of non-corrosive and seawater resistant clamping rails which fit together for perfect sealing.They tighten by means of four screw knobs.